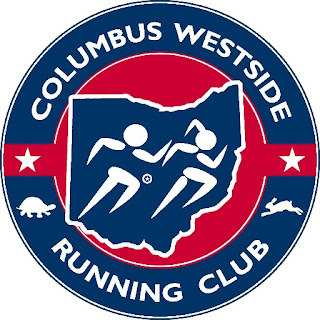 Since moving to Columbus I've run three times with the Columbus Westside Running Club (CWRC), a short drive from home. They run at Westgate Park on Tuesday nights. It has been dark and/or cold for every run so far, so it's hard to meet people. I remember the names of a handful of runners. I'm sure I'll get to know more of them when the weather is better and people stick around longer after the runs. Unlike other running clubs that run a fixed distance each time, CWRC runs for an hour starting at 6:30, and each person completes as many 1.2 mile loops around the park as they want. Some incorporate intervals into their workout. Some members are walkers. Each week the club rotates having the walkers and runners do loops in opposite directions, so you pass and can high-five people along the way. The first week I was unfamiliar with the trail (and also couldn't find my headlamp) and didn't want to run alone, so I ran with Dixie, who is close to my pace. It was nice to have someone to talk to. The second week I ran a little bit with Karen, but she's faster than me, so after a while I had to let her run ahead. But by this time I knew the trail and also had my headlamp. Last night I ran with Carl, the club president. He's faster than me but he slowed to my pace in order to chat about the Bataan Memorial Death March marathon, which he will be running next month. He knew I had run it in 2014 and read my blog, and wanted to ask some questions about gear and approaches to the big hill. 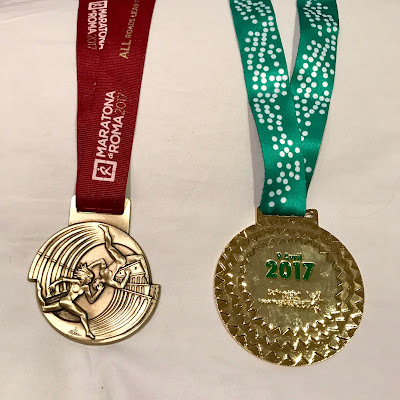 It was nice to share my thoughts on one of the most incredible events I have ever run. Carl has been training hard and expects to be slower than his normal marathon time. I think he's going to do great. His girlfriend Becca, also in the club, will be running the shorter Bataan event. I say shorter, because it's not exactly a half marathon; it's a little bit longer than a half. Both are challenging courses and will be very meaningful experiences for Carl and Becca. I look forward to hearing about their races in March. 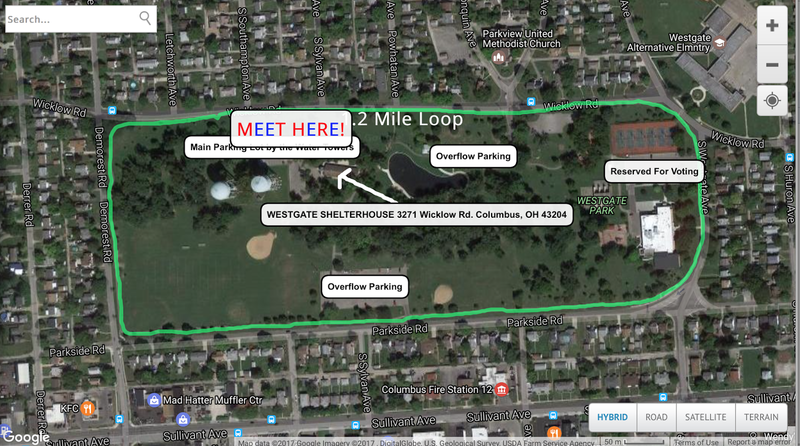 This is Westgate Park in the Hilltop area of Columbus, and where CWRC meets on Tuesdays. We run the perimeter of the park and since it's been dark every time, I don't have a clue what the park really looks like. See the street running north of the "M" in "Meet here"? That's my brother's street; he lives just a half block away. He's not a runner, but he doesn't mind if I stop by after my run to share a beer with him. My running has not been consistent since my move. It wasn't consistent before my move either. I'm not quite in a routine yet. I haven't fully unpacked and nothing is hung on the walls yet. And I'm still looking for a job. The unknown elements of my life and the stress that they bring haven't been helpful to me in getting into a routine. But I'm trying to get into the habit of running on Tuesdays with CWRC. I need to get consistent with other workouts too. One step at a time, I guess. I'm happy to be part of a club that was been welcoming to me and I look forward to getting to know more of the members and participating in community events with them. Thank you for this wonderful post. I am so happy you joined us and cannot wait to spend more miles with you. Yay! You'll do great at Bataan!